Karen Lynn (Hensley) Vogelsong, age 60, of Shermans Dale, and formerly of Harrisburg, passed away on Tuesday, February 5, 2019, after a long ordeal with cancer. Karen was born on Saturday, November 15, 1958 in Richmond, VA to the late James Hensley and Delores (Derk) Hensley. Karen’s survivors include her husband of 37 years, Michael “Mike” Alan Vogelsong; her son, Eric Vogelsong of Shermans Dale; her two sisters: Cynthia “Cindy” Womer and her husband, Gary, of Halifax, Brenda Groy and her husband, Mike, of Annville; her three nieces: Alyssa Kennedy and her husband, Jordan, of Hummelstown, Amanda Abern of Annville, Erica Womer of Halifax; and her beloved canine companion, Princess. Karen graduated from Central Dauphin High School as part of the class of 1977 and then a few years later, attended the Harrisburg Area Community College (HACC). She worked for the Commonwealth of Pennsylvania in the Office of the Budget in Harrisburg, after nearly 13 years of service working as an administrative officer. Karen was a member of Young’s United Methodist Church in Shermans Dale. She liked expressing her creativity by filling up various sketchbooks with her drawings and by painting, which included going to different types of Paint Nite events. Karen enjoyed traveling; she always looked forward to the trips that she and Mike took together each summer. The couple went all over the country to places such as Kentucky and the Columbus Zoo in Ohio. Karen loved taking these trips and many more while riding on the back of Mike’s Harley-Davidson motorcycle. The couple also spent every weekend with one another trying out different restaurants whenever they weren’t relaxing and taking it easy at home. Karen was an animal lover and she loved spending time with her Miniature Pinscher, Princess. She was also quite the social person and had many friends at work. Karen remained very close with her friends and they would often talk on the phone. Karen will be remembered for the way she treated others. She had true concern for those around her; Karen was nice and good to everybody. The most important thing to her was her family. Karen adored her son, Eric, and she cherished the time spent with her family. All are welcome to join Karen’s family at her viewing on Wednesday, February 13, 2019, from 11:00 a.m. until time of service at 12:00 p.m. at Myers - Buhrig Funeral Home and Crematory, 37 East Main Street, Mechanicsburg, PA 17055; with Pastor Travis J. Allshouse officiating. Burial will follow in Rolling Green Cemetery in Camp Hill. Honored to be pallbearers are: Mike Groy, Ben Shultz, Eric Vogelsong, Michael Vogelsong, and Gary Womer. Karen’s family invites everyone to join them for a time of food and fellowship at Hoss’s Steak & Sea House, 743 Wertzville Road, Enola, PA 17025, immediately following the burial. In honor of Karen’s love of animals, contributions can be made to the ASPCA, P.O. Box 96929, Washington, DC 20090, www.ASPCA.org/Donate or the Humane Society of the Harrisburg Area, 7790 Grayson Road, Harrisburg, PA 17111, www.HumaneSocietyHBG.org/Donate. Karen’s family has entrusted her care to Myers – Buhrig Funeral Home and Crematory in Mechanicsburg, (717) 766-3421. 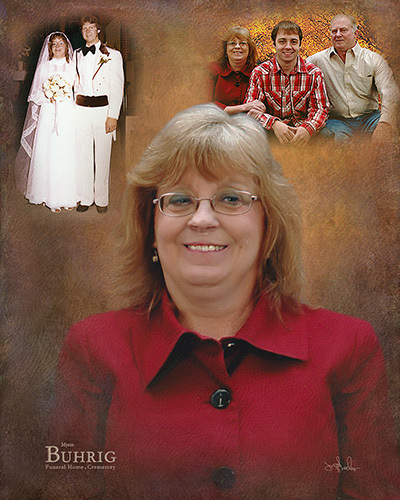 Read Karen’s full obituary, view her portrait, and sign her official guest book at Buhrig.com.